“Up next, the race is on to define the Green New Deal. We're going to talk about the Green New Deal. Will Republicans succeed in painting it as a boondoggle? And will Democrats find a way to translate its idealistic framework into actual policy,” Matthews stated in one of two teases for a softball interview with Congressman Joseph P. Kennedy III (D-MA). The resolution sets the goal of achieving zero greenhouse gas emissions, creating jobs for all, securing clean air and water, upgrading infrastructure, providing high quality health care for all. The proposal pushed by the progressives in the Democratic Party is the opening salvo, of course, in what is expected to be a deeper, longer debate on climate change. 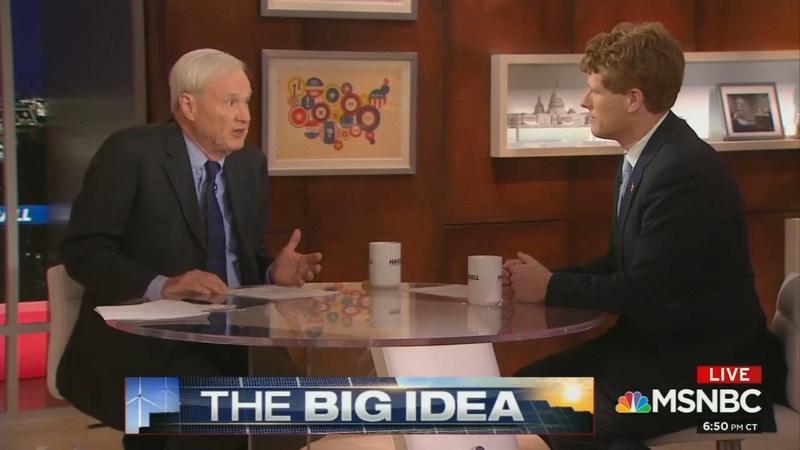 Matthews led into the Kennedy interview with clips of Republican Senator John Barrasso (WY), White House Principal Deputy Press Secretary Hogan Gidley, and President Trump blasting the Green New Deal on the heels of news that Senate Majority Leader Mitch McConnell will put it to a vote.